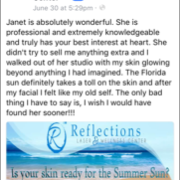 “I’ve been going to reflections for laser treatments for the past 9 months and I love it. Janet is always so helpful, as I also have issues with acne. The whole team is professional and friendly. You won’t regret coming here. Janet is absolutely wonderful. She is professional and extremely knowledgeable and truly has your best interest at heart. She didn’t try to sell me anything extra and I walked out of her studio with my skin glowing beyond anything I had imagined. The Florida sun definitely takes a toll on the skin and after my facial, I felt like my old self. The only bad thing I have to say is, I wish I would have found her sooner.